We seriously cannot get enough of paper plates! They’re such a versatile craft supply so we’ve been having a blast painting, cutting, and gluing them every chance we get. Today we’re sharing three unexpected ways that we’ve been crafting with paper plates lately! All three of these designs are available at Geese & Ganders, as well as a whole ton of other awesome party goods. Take a look at all three ways we used them below! Don’t these black and white Jurassic plates make the best coloring books? 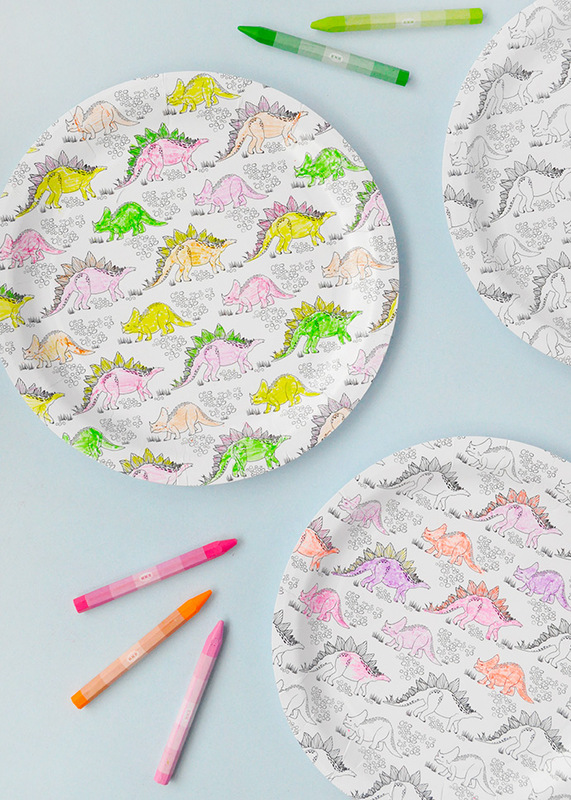 Not only can kids go crazy with whatever colors they like, if you’re hosting a dinosaur-themed bash, order a few extras of these plates so that you can use them for eating on and also as decoration! 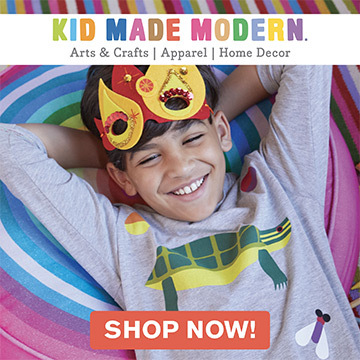 After your kids color in the dino plates, stick them up on the wall as quick and colorful party decor. Beep beep! We love these Big City plates from Geese & Ganders and so will your kids! The rows of buildings are perfect for cutting out and turning into a miniature cityscape for all your kids’ matchbox cars. 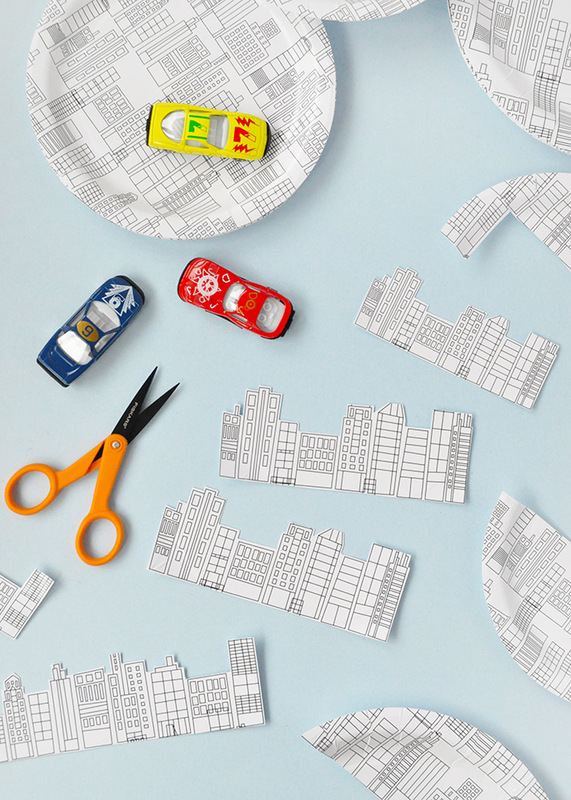 We used both the small and large Big City plates for even more variety – all you have to do is cut the buildings out with a pair of scissors, arrange them in rows and neighborhoods, and get playing! 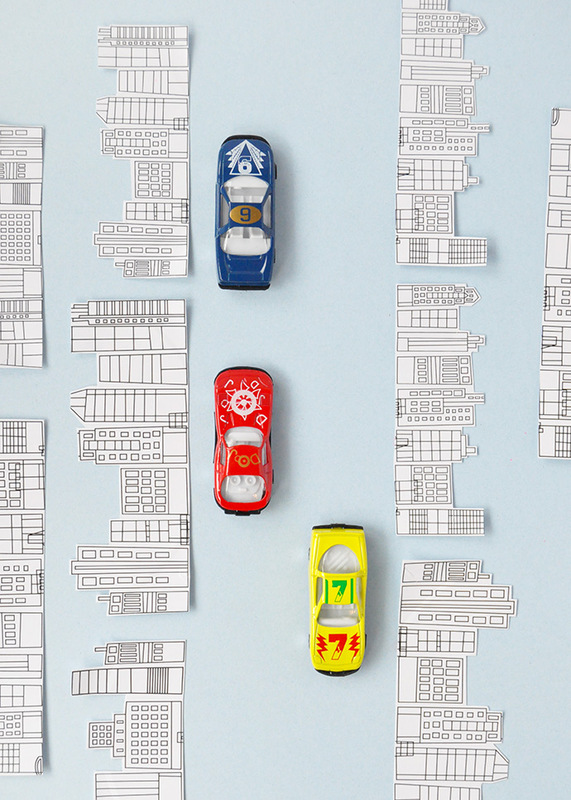 For a more permanent play city, tape or glue the buildings down onto a black piece of construction paper or poster board and use yellow tape to add lines onto the roads. 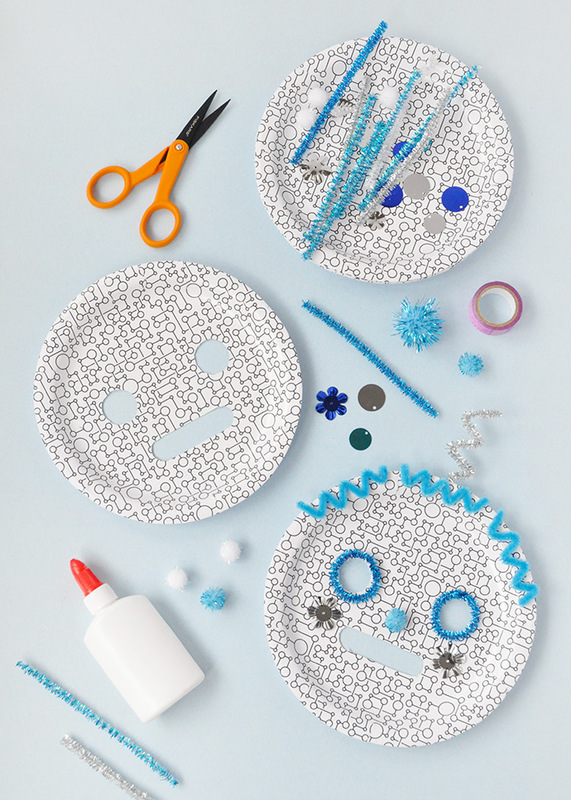 These black and white STEM-tastic plates got us thinking all about robots and technology, so we couldn’t help but turn them into these playful robot masks! All you have to do is use a pencil to draw the face holes you want you cut out on the backside of the plate. Use a pair or precision scissors to cut out the holes and then get decorating! We used pipe cleaners, pom poms, and sequins to dress up this mini robot, but you can go crazy with whatever supplies you have on hand. 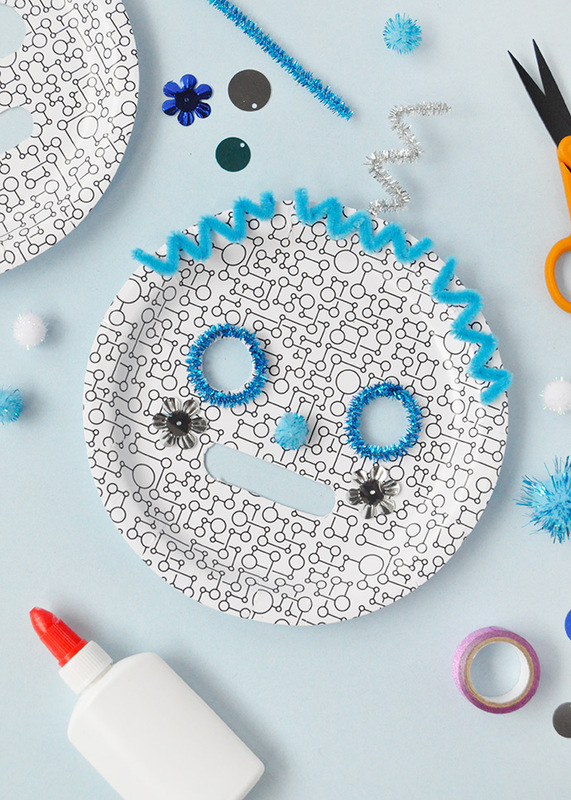 You can make masks for all different sorts of characters, not just robots – it’s actually a great way to repurpose any leftover plates from previous parties, or to give kids a fun activity to do that perfectly matches your party’s theme! 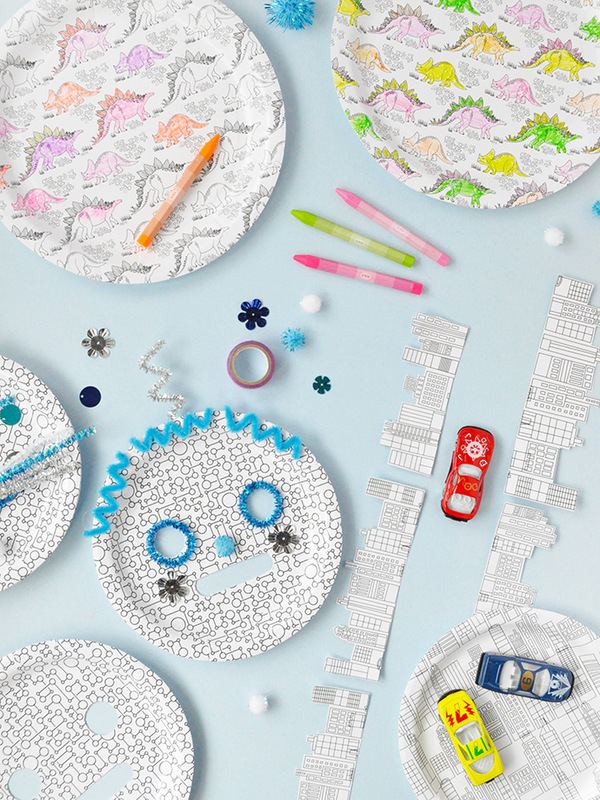 How have you been crafting with paper plates lately? Let us know in the comments below! For even more paper plate crafting, browse past projects right here! And take a look at the amazing plate selection available at Geese & Ganders for more party (and crafty!) inspiration. This is so fun! My kids would never eat if their plates looked like this haha!